Ros was born in Wimbledon, England and in her early teens her family emigrated to Ontario, Canada where she obtained her training as a physiotherapist, qualifying in 1977. She worked there gaining experience in inpatients, musculoskeletal outpatients, hydrotherapy and then in the community. Ros returned to England in 1983 becoming a Chartered Physiotherapist working in the NHS in a variety of posts including stroke rehabilitation, elderly care and Day Hospitals before specialising in musculoskeletal outpatients and women’s health. In 2004 she won an NHS Innovations North Award for a self-referral system to Pelvic Floor Advice Groups for women. 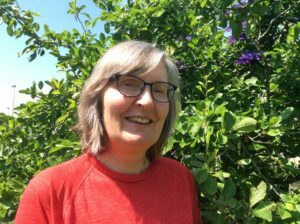 Ros started learning Tai Chi in 1998 with her teachers Jean and Dave Haines in Wigton, Cumbria and continues to train with them in Yang style Tai Chi. Wanting to teach Tai Chi in health care she obtained the Tai Chi and Chi Kung Forum for health teaching certificate in 2004 and in 2009 attended the Tai Chi for Arthritis Instructor/Leaders course. Since 2004 she has taught Tai Chi in the local community for all ages and physical capabilities, including a class for people with Learning Difficulties, Multiple Sclerosis and Parkinsons. Her experience using Adapted Tai Chi Exercises with musculoskeletal and chronic pain patients showed excellent results and she had two papers published on Adapted Tai chi exercises for Complex Regional Pain Syndrome 1 (CRPS 1) in the Physiotherapy Pain Association Journal in 2008 and 2009. 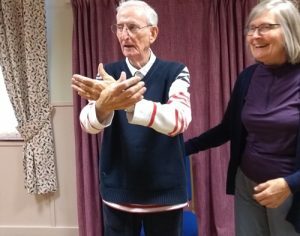 Ros took early retirement from the NHS in 2009 as she wanted to share her expertise with other health professionals and show them how to adapt Tai Chi as a form of mindful exercise for their patients on a one to one basis and in a group situation. She developed the Adapted Tai Chi Exercises courses and has taught them to rehabilitation staff working in the Community, General, Psychiatric (includes Forensic) Hospitals, private clinics as well as many hospices across the UK and in 2017 was invited to teach her course at Pro Motion Physiotherapy in Toronto, Canada.